Grand Stevie Award winners will be presented with trophies at the InterContinental London Park Lane Hotel, on 20 October. Winners of Grand Stevie Awards in The 2018 International Business Awards will be presented with their awards on October 20. 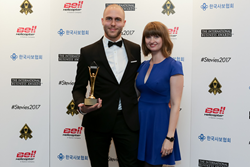 This year’s Gold, Silver, and Bronze Stevie Award winners in The International Business Awards were announced on 9 August. The winners of the Best of the IBA Awards will be presented with Grand Stevie Award trophies at The 15th Annual International Business Awards banquet in London. For more information about The International Business Awards, including a complete list of all Stevie Award winners in the 2018 competition, visit http://www.StevieAwards.com/IBA.